Immunity law needs to be considered by any trial witness wishing to assert the Fifth Amendment right to remain silent. As a Fairfax criminal lawyer, I have experienced several case dismissals for assault cases where the complaining witness hires a lawyer who tells the prosecutor (1) the complainant wants a case dismissal and (2) the complainant will assert his or her Fifth Amendment right to remain silent if called to the witness stand. Faced with a complainant taking the Fifth, the prosecutor has a choice not to put the witness on the stand, to put the witness on the stand and see if the witness proceeds to take the Fifth, to stop asking questions once the witness asserts his or her Fifth Amendment rights, or to seek a judicial order for the witness to testify under a grant of immunity to the witness. When a reluctant prosecution witness hires a lawyer, that lawyer can argue to the trial judge about the extent to which the law does not permit compelling the witness’s testimony. For instance, when a lawyer from Virginia County A offers immunity to the witness, the question still needs to be answered whether the witness’s testimony might still expose the witness to federal prosecution or state-level prosecution in another jurisdiction over which County A’s prosecutor has no control. Two cases for the witness’s lawyer to have at the ready are Kastigar v. United States, 406 U.S. 441, rehrg. denied, 408 U.S. 931 (1972), and Gosling v. Virginia, 14 Va. App. 158•415 S.E.2d 870 (1992). Kastigar addresses the federal immunity statute, for which Virginia has no parallel. 18 U.S.C. § 6002. “Although this concept of coextensive immunity does not require absolute immunity from prosecution before testimony may be compelled, the witness must be provided nothing less than the protection guaranteed by the constitutional privilege. Use immunity, derivative use immunity and transactional immunity are species of immunity that have developed as government has attempted to balance constitutional safeguards with the needs of sound public policy.” Gosling. Immunity caselaw is complex and calls for lawyers to be ready to argue the applicable law and for trial judges to listen to those arguments before ruling. 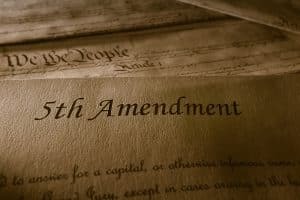 Fairfax criminal lawyer Jonathan L. Katz addresses Fifth Amendment and all other relevant Bill of Rights issues for his clients prosecuted for alleged felony, misdemeanor and DUI offenses. To discuss your case with Jon katz, please call his staff at 703-383-1100 to schedule a confidential consultation.